Santa Rita was founded in 1880, a boom time for Chile while the rest of the world suffered the scourge of phylloxera. Chile was, and remains, a viticultural paradise, with Andean snowmelt for irrigation, low summer rainfall promoting healthy grapes, and the continued absence of phylloxera in the soil obviating the cost of grafted vines. Santa Rita was a driving force from the very start; the founder, Domingo Fernández, introduced not just French equipment and expertise but also electricity to the Alto Jahuel region, where the winery is still based. As Chile’s second largest owner of vineyards, Santa Rita can draw on a great diversity of terroir, where the various grape varieties can be matched to the soil and climate of individual regions. 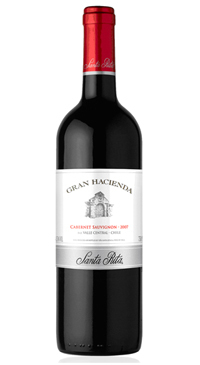 Their Gran Hacienda range expresses the pristine varietal character of Chilean fruit. Easy drinking and food friendly, this wine has a fruity aroma that is dominated by berries, cloves and vanilla. On the palate it delivers a fine concentration of flavour, suggesting juicy ripe blackberries, plums and leather. Great value for the money.